What could be more fun than a birthday tea party for your little girl! Hire Girly-Girl Partea’s for a Pinterest worthy, stress-free birthday for your daughter. All of our birthday party packages include one-of-a-kind printable designs, grand tablescape with real linens, chair covers, color chair sashes and a matching photo curtain backdrop. Our tea party packages also include real china for use during your birthday tea party. We have multiple themes, but can customize any package to craft the party of your dreams. Our classic High Noon Tea Party is the perfect basic package for little girls who want to be fancy. We also offer a princess tea party package themed to the character of your choice. Other options include our Prima Ballerina, Mad Hatter themed Alice in Wonderland Party, and Tinkerbell inspired Fairy Party. Have a special teen or adult birthday, baby shower, bridal shower or want a ladies night out? We have the perfect package for you! We will deliver and set up a girly-girl party just for you! 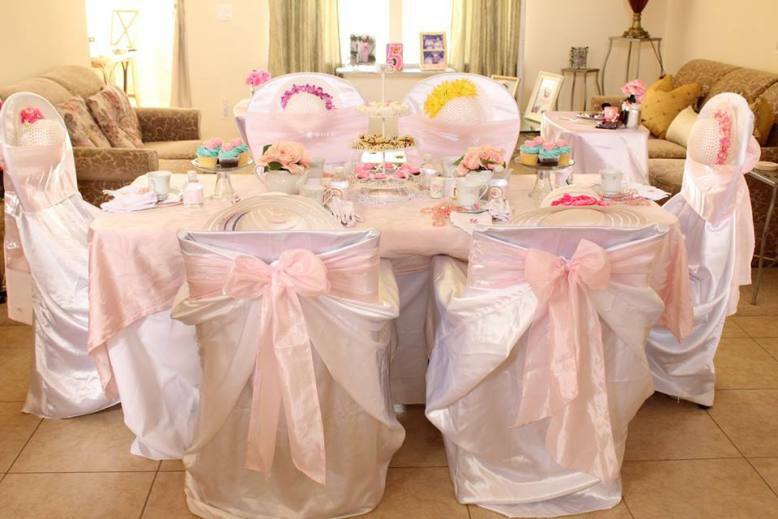 Real tea cups, satin chair covers with pink sashes, a photo backdrop and more. We can customize your decor for your next special event.